Seth Rollins has made his decision … he’ll attempt to slay “The Beast” at WrestleMania! Due to his Royal Rumble win last night, Rollins was told by Triple H at the top of Raw this week that he’d have to make his WrestleMania decision by the end of night. 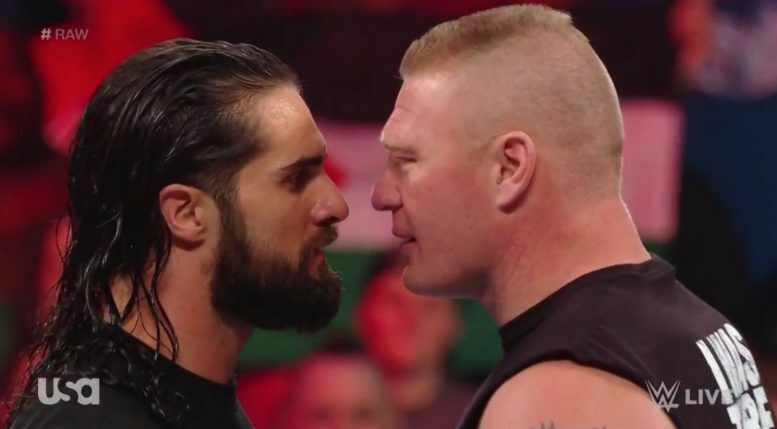 The show closed with Brock Lesnar and Paul Heyman coming to the ring to gloat about how it takes a special kind of being to beat Brock, so Seth would choose Daniel Bryan as his opponent at WrestleMania. Seth then hit the ring and got physical with Brock, but got hit with a number of F5s. After the show went off the air, WWE.com confirmed Lesnar and Rollins will go one-on-one at “The Show of Shows” for the Universal Championship. The last and only time they faced off in a one-on-one encounter was at Battleground 2015. The match ended in a disqualification due to Undertaker interference. Watch video of Lesnar’s beatdown of Rollins below!